Hawaiian Airlines expects solid unit revenue traction during 2Q2014 as it shifts some capacity from Asia back to the US mainland and perhaps sees some improvement in its long-haul network. It's long-haul network has been a weak performer for the airline during the last couple of years as currency shifts have hurt and it still waits for several new routes to mature. The airline is now in a state of limbo as it aims to slow its previous rapid capacity growth in CY2014 while the investments made in developing its long-haul network should start to materialise slowly. The slowdown in growth is welcome, but challenges loom large for Hawaiian in ensuring all regions in its network make an overall positive contribution. Hawaiian’s favourable performance in its North American and inter-island markets should continue to help the airline turn a sound top-line revenue performance; but growth in those maturing markets its limited, emphasising the importance of Hawaiian’s successful execution of is long-haul strategy. Hawaiian projects that its passenger unit revenues should grow 3% to 6% year-on-year during 2Q2014 after increasing 5% in 1Q2014. The revenue projections are encouraging given that Hawaiian dropped its long-haul flights from Honolulu to Taipei in Apr-2014 and is gearing up to cut flights from Honolulu to Fukuoka, Japan at the end of Jun-2014. The airline is redeploying capacity from those routes elsewhere in its network – upgauging Honolulu-Seoul from Boeing 767-300s to A330s as well as replacing 767s on service from Honolulu to Oakland with A330s. During 2014 Hawaiian is shedding four 767s and adding six A330s. Its last A330 widebody is scheduled for delivery in 2015. Hawaiian has six Airbus A350-800s and 16 Airbus A321neo narrowbodies in its order pipeline; but delivery of those aircraft is beyond 2016, which should allow Hawaiian to keep its annual capacity growth within the single digit range after recording 19% growth in 2011, 22% growth in 2012 and 14% growth in 2013. It currently anticipates 5.5% to 8.5% ASM growth in 2014. Hawaiian launched flights from Honolulu to Beijing in Apr-2014, and has not declared plans for any new long-haul markets in the near future as it works to lessen the overall percentage of new routes – markets in operation less than a year – in its network. By 4Q2014 Hawaiian anticipates that only 8% of its markets will fall under the new route classification compared with 25% in 4Q2013 and 30% in 4Q2012. Combined Hawaiian and Air China presently offer approximately 1,707 one-way seats between Honolulu and Beijing. 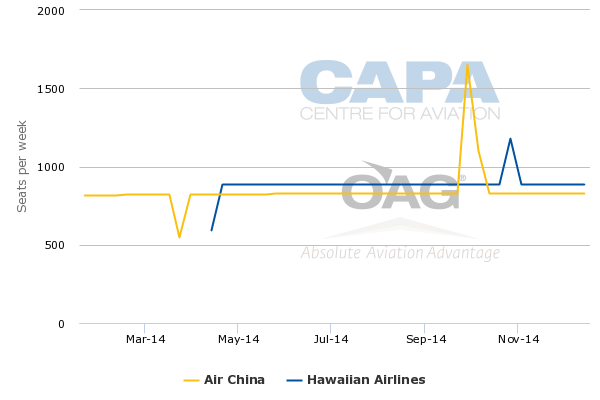 Based on current schedules in CAPA and OAG, Hawaiian holds a 52% share and Air China represents a 48% share. Hawaiian and Air China (which launched Honolulu-Beijing in Jan-2014) have forged a codesharing agreement that covers beyond flights at each airline’s hub in Honolulu and Beijing, which could bode well for Hawaiian’s market entry into China. It allows each airline to market a much broader network, and gives Hawaiian an opportunity to leverage Air China’s brand as it works to increase its point of sale in Beijing. Just as Hawaiian’s Honolulu-Brisbane flights grow closer to reaching maturity, Australia’s Jetstar is to introduce service on the route in Dec-2014, breaking Hawaiian’s monopoly status. As Jetstar enters the market with A330s, Hawaiian is upgauging aircraft on the route from 767s to A330s. Jetstar’s entry into the market should not be a complete surprise to Hawaiian, as the Qantas/Jetstar group has no doubt tracked Hawaiian’s performance on the pairing since Hawaiian debuted the route in 2012. Honolulu can sometimes be an alternative connecting point to other US markets compared with the much busier Los Angeles International Airport. The US represents the third largest country market from Brisbane measured by seat deployment. In addition to Hawaiian’s Honolulu-Brisbane service, both Qantas and Virgin Australia operate service from Brisbane to Los Angeles and Qantas has flights between Brisbane and Dallas/Fort Worth. He did stress, however, that Brisbane has different market dynamics to Fukuoka. Mr Dunkerley highlighted Hawaiian has many more years of experience in product distribution in Australia versus other new long-haul markets. Hawaiian recently marked a decade in the Honolulu-Sydney market. As Hawaiian works to mature its long-haul network, the airline should reap some small benefit from the cessation of go!, the inter-island subsidiary of US regional carrier Mesa Airlines. go! ended service in Apr-2014, just as 2Q2014 was getting under way. In 1Q2014 inter-island routes represented 25% of Hawaiian’s passenger revenues and generated unit revenue growth of 8.5%. Even though go! operated with less than a handful of 50-seat Bombardier CRJ200s, the slight capacity decrease should keep Hawaiian’s performance in the market strong. Hawaiian is seeing some cost pressure from the launch of its new inter-island turboprop operator Ohana, which debuted in Mar-2014. The airline operates 48-seat ATR-42 turboprops from Honolulu to Molokai and Lanai. In Jul-2014 Ohana is adding service from Hawaiian’s Maui hub to Molokai, Kona and Hilo. 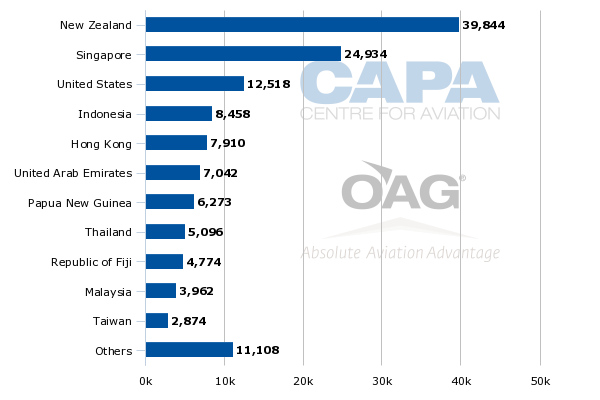 Based on schedules in CAPA and OAG, Hawaiian faces little competition in these markets. Mokulele Airlines operates flights from Maui to Kona and Island Air offers service from Honolulu to Lanai. From a big picture standpoint, Ohana will represent a very small portion of Hawaiian’s overall operations. Hawaiian projects just two ATRs in operation during 2014 and three in 2015. So the cost pressure from the carrier’s launch should evaporate fairly quickly. Hawaiian is projecting a 4% to 7% increase in its unit costs excluding fuel during 2Q2014. Previously the airline has explained it expects unit cost inflation in 1H2014 from the start-up of Ohana, expenses incurred from cabin modifications for its new economy comfort product and the cost of complying with new pilot duty time regulations. The airline believes some of that cost pressure should recede during 2H2014. Hawaiian also remains bullish about its North American markets even as it increases capacity to the US mainland shortly after a supply equilibrium was restored from Hawaii to the mainland. In addition to upgauging Honolulu-Oakland, Hawaiian is adding year-round service from Maui to Los Angeles, and re-launching Honolulu-San Jose. The airline feels comfortable with the recent changes, citing its loyalty base in Los Angeles and improving revenue trends in San Jose. North America still represents the bulk of Hawaiian’s revenues – roughly 47% during 1Q2014. The airline enjoyed 11% unit revenue growth in those markets during the quarter. There is a possibility that unit revenue growth could slow as Hawaiian expects competitive capacity in its North American markets to grow 2% year-on-year in 2Q2014 and 6% during the summer high season in 3Q2014. Still, Hawaiian expects yield strength in North America in 2Q2014. It is not clear how Hawaiian’s long-haul unit revenues will fare in 2Q2014, although there was sequential improvement from the 10.6% decline in 4Q2013 to the 7% drop in 1Q2014. Hawaiian not surprisingly cites continuing improving trends in its long-haul network, which after the cuts to Fukuoka and Taipei encompasses eight destinations – Tokyo Haneda, Sapporo, Seoul, Osaka, Brisbane, Auckland, Sendai and Beijing. With the axing of loss-making markets and the slowing of its previously rapid expansion, Hawaiian’s improvement in revenue declines in its trans-Pacific network should continue. If 2014 is the year when Hawaiian catches its breath from the launch of 10 long-haul international destinations since 2010, then the airline should turn a corner and perhaps post positive results in those markets in 2015 and beyond. But understandably Hawaiian has not made any predictions of when it can declare success on its routes to Asia and Australia – the only certainty is there is ample room for improvement.